Longtime dealer Tom Nemet of Jamaica, N.Y., - pictured in 2007 - was 76. He operated Chevrolet, Hyundai, Nissan, and Volvo franchises through the years. 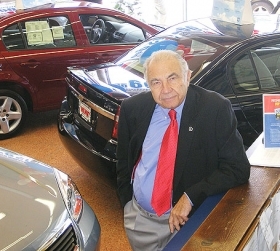 Tom Nemet, owner of the Nemet Auto Group in Jamaica, N.Y., and a major advocate for new car dealers and foreign brands, died July 4. He was 76. Nemet had been battling cancer for 18 months. Under Nemet's leadership, Nemet Motors, founded in 1916, grew to become the Nemet Auto Group with Hyundai, Kia, Nissan and Volvo stores. He also operated a Chevrolet franchise during his career. Nemet founded the import dealers' political action committee Auto Dealers and Drivers for Free Trade and spent years lobbying Capitol Hill on behalf of dealer causes. He served as chairman of the American International Automobile Dealers Association in 1984. In the early years, before Honda, Nissan, and Toyota were household names, Nemet worked with others in the industry to block proposed legislation and regulations that would have kept lower-priced cars and trucks out of the reach of consumers. He also lobbied to make sure banks and other lenders would offer reasonable credit terms, making a new car or truck affordable for consumers.